A close-up of a solar flare taken with the Transition Region and Coronal Explorer (TRACE) spacecraft in September 2005. Powerful radiation bursts from solar flares unleashed by the Sun in 2001 struck Earth and Mars within minutes of each other and affected the upper atmospheres of both planets in similar ways, a new study finds. The solar flare measurements were made by NASA's Mars Global Surveyor (MGS) spacecraft, which has orbited the red planet since 1999, and by satellites circling Earth. The finding, detailed in the Feb. 24 issue of the journal Science, could have implications for future Mars missions, since solar flares striking Earth have been known to affect communication and navigation satellites and are often followed by other types of space particle storms that are potentially dangerous for astronauts. On April 15, 2001, satellites around Earth recorded the creation of large amounts of electrons and charged particles, called ions, in the planet's ionosphere from ultraviolet radiation and X-rays unleashed by a solar flare. The same thing happened again on April 26. The ionosphere is the part of a planet's upper atmosphere that absorbs solar radiation. "The energy of the X-ray photons is so great that once absorbed by the molecule they eject an electron from the atom, leaving an ion behind," explained study member Paul Withers from Boston University. During both solar flare events, the MGS spacecraft recorded similar alterations in the Martian ionosphere just minutes after the flares struck Earth. The finding confirms that solar flare radiation affects the ionospheres of Earth and Mars in similar ways, despite the different chemical compositions of the planets' atmospheres. Earth's ionosphere is populated largely by oxygen and nitrogen, while the Martian ionosphere contains mostly carbon dioxide. "Since the Martian atmosphere is different in some ways, we can take theories that have been developed in the terrestrial case and test whether they work on Mars as well or whether there are areas that need improving," Withers told SPACE.com. "If you study the effect exclusively on terrestrial conditions, you might not understand the general physical principle underlying [solar flares] but only a specific case of how it works," he said. Work on solar flares could prove important for future missions to Mars that might eventually be part of a plan outlined by President Bush in 2004. On Earth, solar flares have been known to damage or skew results from satellites such as those making up the Global Positioning System (GPS). "If humans go to Mars and have a similar positioning system there, knowing about ionosphere effects will be important," Withers said. While solar flare radiation is typically not dangerous to humans if they are are at Earth's surface or have proper protection, the flares can be followed by streams of high-speed particles called protons. These "proton storms" are potentially lethal to astronauts and have been known to reach Earth in as little as 15 minutes. 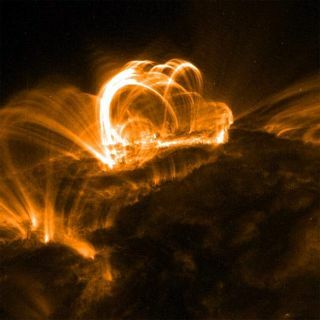 Solar flares can also fuel giant clouds of electrified gas, called coronal mass ejections, which can billow into the solar system and overtake Earth in a matter of hours or days. These two space phenomena are harder to shield against and can be dangerous to astronauts. On Jan. 20, 2005, the International Space Station was struck by a proton storm so powerful that its crew had to take shelter in the bulkier Russian side of the station, in a section designed with such storms in mind. Also, radiation from solar flares, combined with the normal doses of radiation that astronauts are routinely exposed to while in space, could put astronauts over the estimated limit as outlined under NASA guidelines. Unlike Earth, which has a strong magnetic field and a dense atmosphere to deflect most solar flare radiation, Mars is relatively naked to space weather.